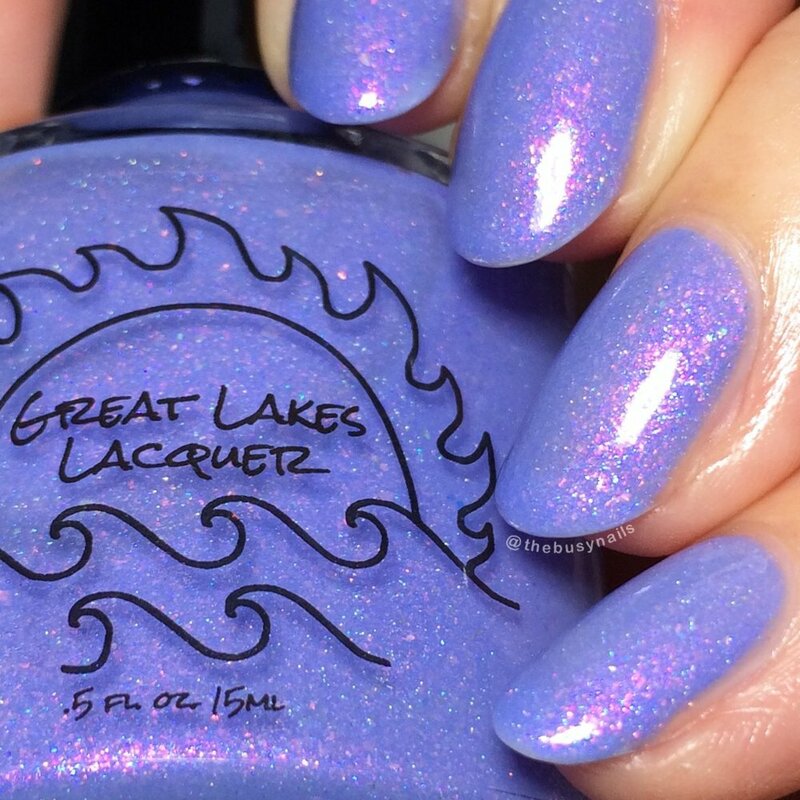 I'm verrrry excited to share the Great Lakes Lacquer Polish Con colors with you! I attended the first ever Polish Con last fall (2016) in Chicago with some lovely ladies I've met through the nail world. We had such a great time and I had planned to go back this year, but I have a wedding the same day, so it's a no-go. 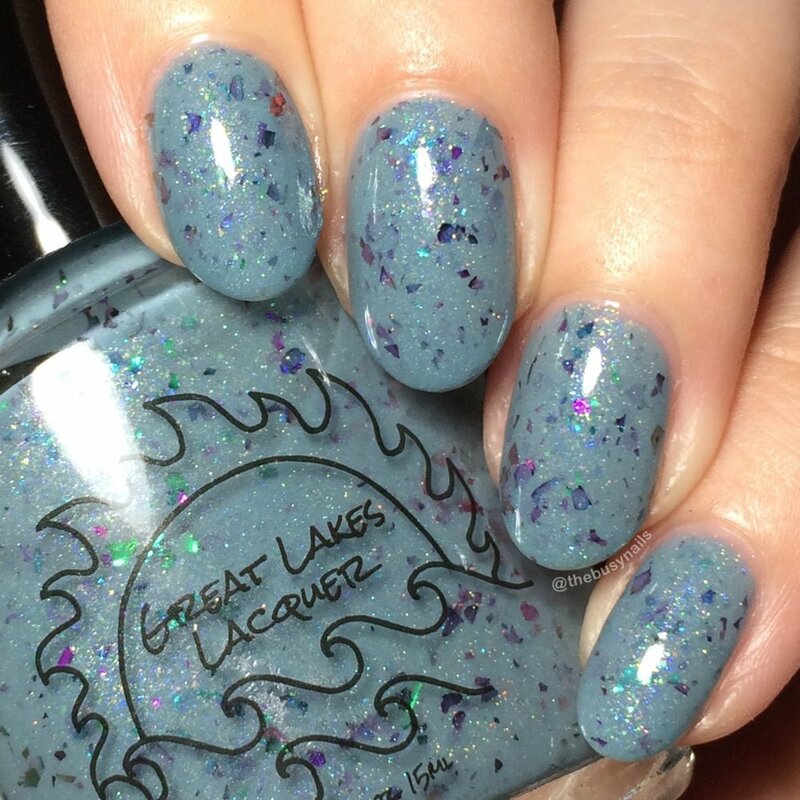 But thanks to Mariah, the maker behind Great Lakes Lacquer, I still get to experience some of the gorgeous polishes! 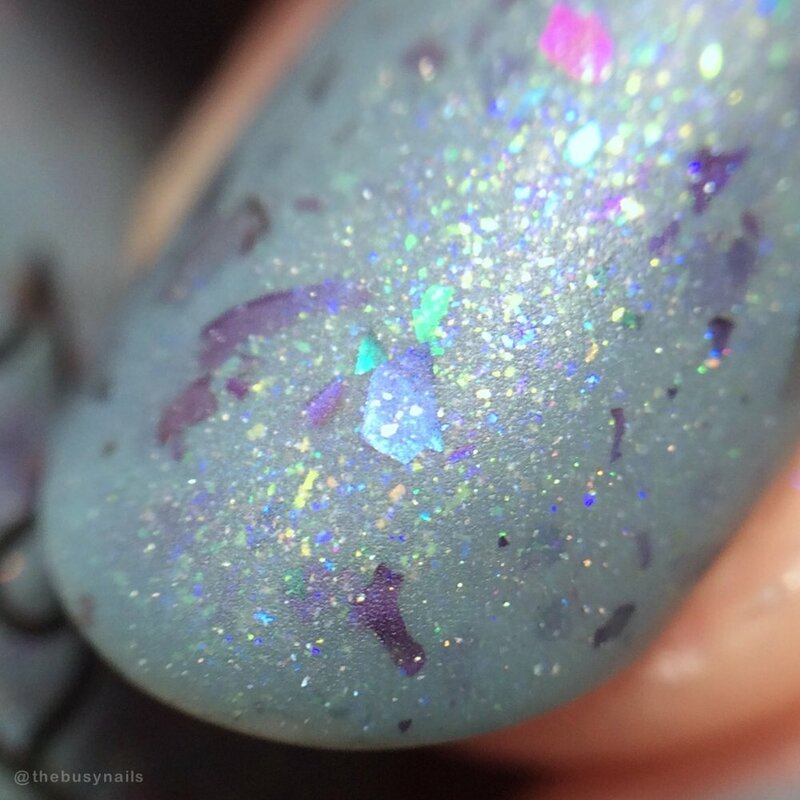 These are highly photogenic polishes, so be prepared for lots of photos! I'm listing purchasing details, price, etc. next to each polish since it varies per shade, but these will all be available to purchase at Polish Con on September 23 in Chicago. Let's get into the swatches! All photos in this post are taken under artificial light. I used Talon Super Swatch & Peel base coat by Nail Hoot, (a clear peel-able vinyl base), and all are topped with Glisten & Glow HK Girl topcoat. Matte swatches are topped with Nina Ultra Pro matte topcoat.These polishes were provided for my honest review. Purchase info: Buy it at Polish Con or in the GLL shop on 9/30 at 2pm EST for 1 week only. Shenanigans happen everywhere, all the time. 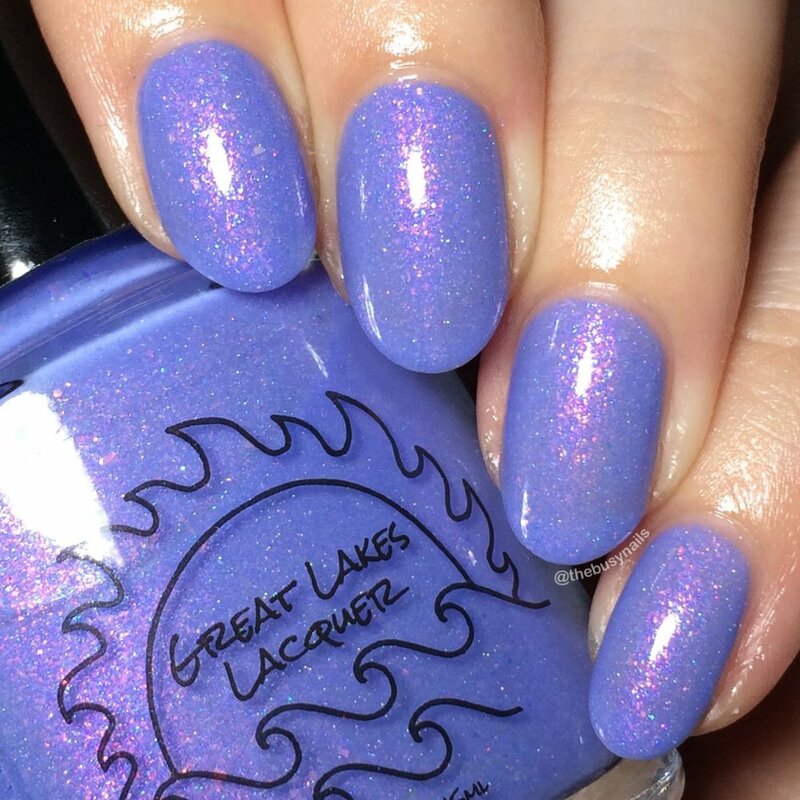 Keep your eyes open with this glowing lilac filled with several shades of shifting shimmer (blue, purple, red, pink, gold, green). 2-3 coats for an opaque look. THIS COLOR!!! This is my kind of color. 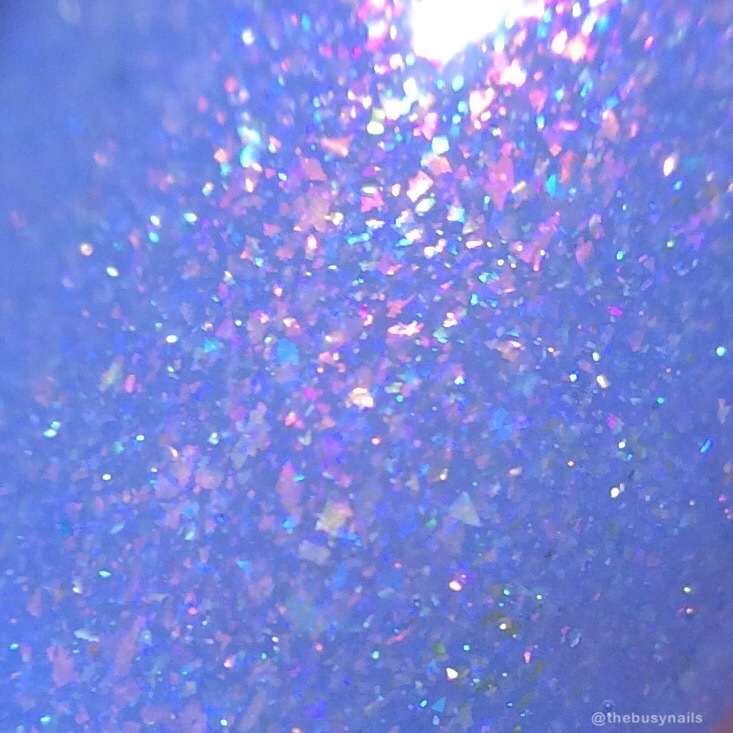 I've actually been meaning to do a roundup post of all my favorite lavender/periwinkle/shimmering polishes, because I have quite a few and love them dearly. This is no exception. It's absolutely gorgeous and the shimmer inside seriously glows. Shiny or matte, it's beautiful either way and easily my personal favorite of the bunch. Try not to drool over the macros when you see all those beautiful little flakes. Fantasies in the Festival Hall called for this deep violet build-able jelly with red to green shifting shimmer and red to bronze multichrome flake with just a bit of scattered holo. 2-3 coats for an opaque look. This is one gorgeous fall polish! It's filled to the brim with flakies and shimmer, giving it a really fiery glow. It's very buildable, easily becoming opaque in three coats, but I think it could also work as a topper over a dark base. The shimmer has a gorgeous color shift, so I've included one of my shift collages to show the variety. Purchase info: This one is exclusive to Polish Con. Any left after the show will be listed in the GLL shop on 9/30 at 2pm EST. It will not be remade so if it sells out, it will not be listed. 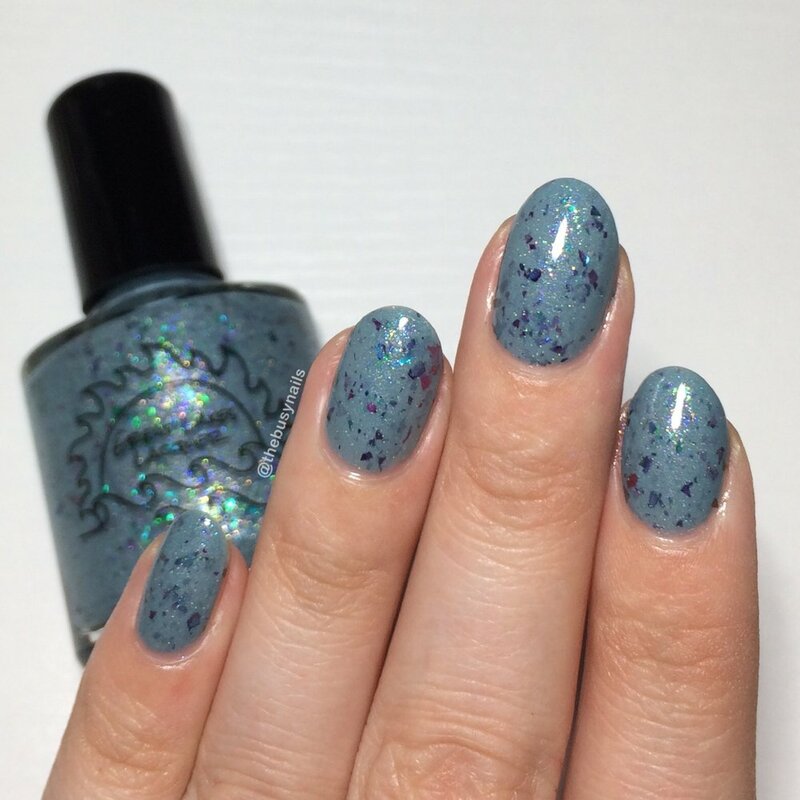 Pale, grayed out sea blue with shimmery shifts of blue and green with multichrome flake that peaks out in purple, blue, green, and orange at certain angles. 2-3 coats for an opaque look. I'm not always a huge fan of large flakies in polishes, but the base color really drew me in to this one. It's so pretty! And for all the flakies, it's still very easy to work with, needing just two coats. My favorite part are the smaller shimmers and sparse holo that you can see in the background and in the macros. Whew... that was a lot of photos! All three polishes will be available at Polish Con Chicago on Sept. 23, 2017. Chicago Shenanigans and Festival of Flakies will be listed in the GLL shop on 9/30 at 2pm EST for 1 week only. Meet me at Shedd is exclusive to Polish Con. Any left over after the show will be listed in the GLL shop on 9/30 at 2pm EST. It will not be remade so once it's gone, it's gone for good.